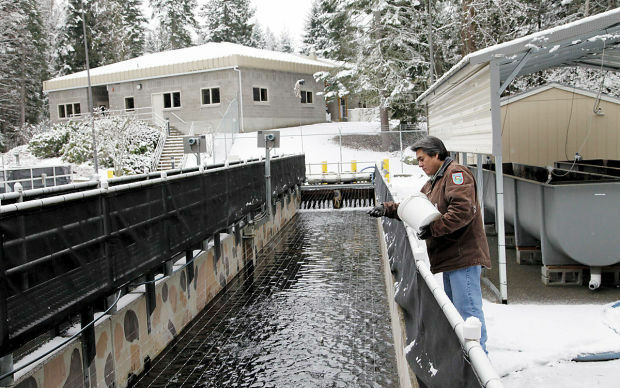 A hatchery in Parkdale, Ore., a hatchery worker measures and weighs salmon as part of a study to track their growth. 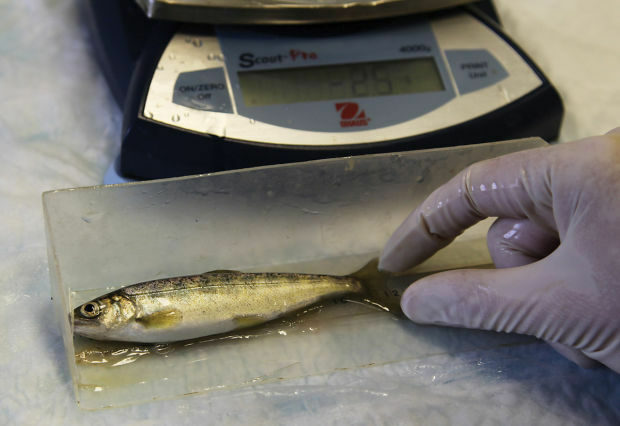 Studies have shown artificial breeding makes for weaker fish and can harm wild populations, and critics hope recent lawsuits on the west coast can reform how hatcheries work. Hatchery technician Keith Moody feeds about 30,000 salmon smolts in a rearing pond. People on the West Coast have counted on fish hatcheries for more than a century to help rebuild populations of salmon and steelhead and bring them to a level where government would no longer need to regulate fisheries. Hood River hatchery coordinator Chris Brun looks at the weirs recently installed to catch salmon and steelhead returning to the hatchery to spawn in Parkdale, Ore.
PARKDALE, Ore. — People on the West Coast have counted on fish hatcheries for more than a century to help rebuild populations of salmon and steelhead decimated by overfishing, logging, mining, agriculture and hydroelectric dams, and bring them to a level where government would no longer need to regulate fisheries. Environmentalists and many scientists argue the only way to bring back wild fish is to remove dams that produce the region’s cheap power, but the government has ruled that out. The hatchery lawsuits are trying a different tack. Last month, an Oregon judge ordered officials to do more to ensure hatchery fish don’t stray into wild fish habitat and harm wild fish on the Sandy River, a Columbia River tributary. Lawsuits have been filed to limit or block the release of hatchery-raised fish into Oregon’s McKenzie River and Washington’s Elwha River. “We need to maintain healthy and abundant wild populations not only for their own sake, but to be a supply of fish for hatchery production and to keep hatchery programs cost effective,” Bakke said. About 400 hatcheries operate throughout the West Coast today. In the Columbia River basin, about 180 hatchery programs breed millions of fish in plastic trays, transfer them to rearing “ponds,” and then release them to join wild ones travelling down river to the Pacific Ocean, to later return to the same river to reproduce and die. Most hatcheries are devoted to turning out fish for fishermen to catch. But “much of the effort is to try to figure out ways to both maintain significant hatchery production and limit impacts to wild populations,” said Mike Ford, conservation biology division director for NOAA Fisheries’ Northwest Fisheries Science Center in Seattle. Ford and other proponents say artificial breeding has benefits: it can bring back fish to rivers where they have been wiped out. That’s already happening on the Hood River, where the Confederated Tribes of Warm Springs and Oregon biologists have reared Chinook salmon for over two decades. Their population has increased, enough to re-establish limited fishing for the tribe and other fishermen. Jim Lichatowich would argue that predictions about “record” runs of salmon returning to the Columbia River this fall aren’t telling the whole story. Runs of hatchery salmon go up and down from year to year, he points out — but none in recent decades equal the bounty of fish that swam up the river before European settlers arrived with their fishing fleets and, later, their dams.